Cal Lee and Warren Shaw are breaking down the 1st Round of the Western Conference Playoffs. While the Beast Roam in the East, the Ultimate Test lies in whoever will come out of the West. Some exciting and riveting match ups lie ahead and we give you the 411 with our Special Guest Mark Kaplan from Dynasty Sports Empire and Fantasy Alarm. The seeds are set, and parity will be at all time high. 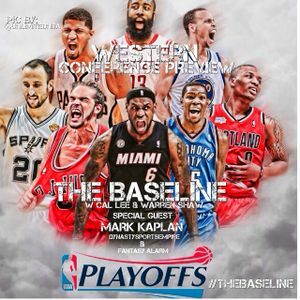 Tune in with us as provide insight, analysis and predictions of the 1st Round of the Western Conference . The (1) Spurs sit atop NBA&apos;s best but will they need to Watch Their Throne against the (8) Dallas Mavericks? Can Kevin Durant maintain his MVP Form against the NBA&apos;S grittiest team (7) Memphis Grizzlies? With a retooled Blake Griffin and Doc Rivers in LAX, are the (3) Clippers ready to make their "run" to prominence in Lob City or will the (6)Golden State Warriors carve out another 1st round upset? Are the (4) Rockets as good as advertised or will (5) Trailblazers earn their respect?